I dedicate this thesis to my father Mosiori, my late mother Nyaboke, my loving wife Mwango, my beautiful daughter Joyce, sons Ogoti, Okong’o and Mienya. Figure 5.10: (a) Absorption coefficient of Cd x Zn1- x S against wavelength. Figure 5.10: (b) Extinction coefficient of Cd x Zn1- x S against wavelength. In this research an n -type Cd x Zn1- x S and p -type PbS thin films were optimised for solar cell applications employing chemical bath deposition technique. The thin films were prepared using thiourea and nitrates of cadmium, zinc and lead. Deposition of optimised Cd x Zn1- x S was done by CBD at 820 C and in alkaline conditions while that of PbS was done at room temperature and both films at normal atmospheric pressure utilizing aqueous conditions. This study concentrated on optimising optical and electrical characterization of the films. Optical constant suitable for photovoltaic applications were sort for and for this purpose a UV VIS IR spectrophotometer 3700 DUV was utilised while the electrical properties were investigated using a four point probe connected to a Keithley 2400 source meter interfaced with computer. The optical band gap of the as deposited Cd x Zn1- x S films varied from 2.47eV (x =0.6) to 2.72 eV (x =1.0), and transmittance above 79% in the VIS - NIR region for the concentration range of x = 0.6 to 1.0, that is, the band gap increased with increasing Zn concentration of the alloy and Cd 06 Zn0.4S sample showed the widest band gap. It was obtained that the presence of zinc increased optical band gap. The average extinction coefficients for the as deposited CdxZn1-xS samples were very low revealing that they absorb very little radiation hence a good window layer material. As measured by the four point probe connected to a Keithley 2400 source meter, electrical resistivity increased with increase in Zn in the bath in Cd x Zn1- x S and a resistivity range of 9.5×101 - 1.22× 102 Ω-cm was obtained. These properties are appropriate for window layers used for photovoltaic cell applications. PbS thin films had a band gap of 0.89 eV and a transmittance of below 55% appropriate for absorber layers of photovoltaic cells and a resistivity range of 6.78 × 103 to 1.26 × 104 Ω-cm. The fabricated photovoltaic cell had a short circuit current, Isc = 0.031 A, open voltage, Voc = 0.37V, efficiency, η = 0.9% and a fill factor, FF = 0.66 implying that the two materials are appropriate for photovoltaic applications especially in the VIS and IR light spectrum. Thin films can be used to fabricate optoelectronic devices that can convert solar energy into electrical energy for various uses. This can be achieved if their structure, inter-band transitions and other optical properties are maximised to harvest enough solar radiation to provide energy. Activities that take place when electrons transit between energy bands in thin films are of fundamental importance in harvesting solar radiation just like all fuels derive their source by utilizing solar energy (Chapin and Pearson, 1954). Although solar energy is abundant it has not been harvested well. Obtaining energy by use of solar cells does not require sophisticated and expensive facilities. Thin film nanotechnology has been able to fabricate cheap optoelectronic devices that produce power for homes, small commercial uses or electric current for other uses (Schroder, 1998). It is a source of energy that is reliable, easy to maintain and even install (Armin, 2009) and because of some of these advantages over other forms of fuels, there is need to research on thin film materials with good photoelectrical properties in the visible range and those that extend into the IR and UV regions for photovoltaic cells (Siu and Kwok, 1978). Photovoltaic cells are known to absorb light (photons) from the sun and convert them directly into electricity. They consist of a p -type layer which has a majority hole carriers and an n - type layer that has a majority electron carriers as shown in Figure 1.1. Figure 1.1: p -type and n -type thin film cell (Breeze et al., 2001). These layers form a diode in the form of a p - n or p-i-n junction that enables current to flow when electron-hole pairs are created at the junction (Kassim et al., 2010). When a photon with energy greater than the band-gap of the semiconductor passes through such a cell, it may be absorbed by the material and this takes the form of a band-to-band electronic transition producing an electron-hole pair. Several types of thin films have been fabricated and used to manufacture photovoltaic cells. Various methods of preparing thin films for photovoltaic applications have been used that include chemical deposition, liquid deposition and chemical vapour among others. Chemical bath deposition (CBD) is one of the noble methods. Many researchers have devoted their efforts to this method because it is a non-expensive method for thin film preparation. Through this method many noble materials have been developed. Among these noble materials that are of great interest include metal chalcogenides especially binary (2) elements such as CdS and PbS from group II and group VI elements. Doping them through CBD has been done to make them suitable for use as window layers using different elemental dopants like boron (Khallaf et al., 2009), indium (Shadia et al., 2008), arsenide and chlorine (Amanullah et al., 2005) to improve efficiency of their photovoltaic cells but these cells have shown low efficiency due to their high spectral reflectance and resistance. It has been proposed that if they are doped to take a ternary form and then be used as thin films cells then their cells are expected to improve. Ternary derivatives of CdS have generated a lot of research interest because of their varied applications in the field of optoelectronic devices. One such compound is cadmium zinc sulphide (Cd1- x Zn x S) which is gaining prominence as a good candidate for wide band gap materials for photovoltaic and photo-conducting devices. Its band gap can be tailored to vary from 2.43 eV to 3.32 eV depending on its constituents and preparation technique. The addition of Zn to CdS is believed to enhance open-circuit voltage (Voc) and short-circuits current (Isc) in hetero-junction devices as a result of the decrease in the window absorption losses. It has also been proposed that to replace CdS with the higher energy band gap ternary Cd x Zn1- x S may led to a decrease in window absorption loss and a decrease in the lattice mismatch with the Cu(In,Ga)Se, Cu2S and other absorber semiconductors and hence higher efficient cells (Kasim et al., 2008). Lead chalcogenides thin films deposited by CBD have been investigated (Ghamsari and Khosravi, 2005) and they have shown to possess a well defined band structure in which their energy gap varies continuously between 0.41 eV to 2.7 eV depending on the method of preparation. Since their band gap ranges within the optimum theoretical band gap for maximum absorber material of about 1.5 eV, they can be used to fabricate photovoltaic cells (Popa et al., 2006). To obtain good quality and cheap semiconductor thin films of Cd x Zn1- x S and PbS for photovoltaic cells using CBD the influence of factors like temperature and concentration need to be optimized. This research thesis investigated a ternary material semiconductor (Cd x Zn1- x S) based on cadmium, zinc and sulphur and a binary PbS material based on lead and sulphur. These materials were optimised for photovoltaic application and a solar cell was fabricated and characterised employing the optimised thin films. It is generally agreed that thin films deposited by CBD have good qualities and they can be deposited on large scale areas. Chemical bath deposition will be used to deposit CdZnS and PbS thin films. Films of these materials have high resistivity and low optical transmittance that limit their uses as optical materials for photovoltaic applications and hence the need to improve the optical and electrical properties of the said films. In addition very little information is available on transmittance, resistivity and absorbance on Cd x Zn1- x S thin films. This study was aimed at investigating Cd x Zn1- x S and PbS thin films deposited under various controlled conditions for photovoltaic cell applications. To deposit as well as optically and electrically characterise Cd x Zn1- x S/ PbS thin films for photovoltaic applications. i) To deposit thin films of Cd x Zn1- x S and PbS by CBD technique. ii) To investigate electrical resistivity of Cd x Zn1- x S and PbS thin films using the four point probe method. iii) To investigate the optical properties of Cd x Zn1- x S and PbS thin films using solid Sec 3700 Optical Spectrum analyzer. iv) To fabricate and characterize a Cd x Zn1- x S / PbS photovoltaic cell using a solar cell simulator. Kenya is along the equator and based on its location, it receives a lot of solar energy each year. Just like other countries along the equator its solar energy harvesting employs on silicon based photovoltaic cells which are consequently costly. Therefore there is need for alternative materials which are cost effective. The ternary alloys of semiconductors offer cheaper alternatives. Ternary alloys are known to have a well defined band structure in which their energy gap varies continuously with composition between their values in the constituent compounds. Some ternary semiconductors have direct band gaps required in the fabrication of photovoltaic cells. One such ternary semiconductor is Cd x Zn1- x S which can be used to fabricate cheap photovoltaic cells. There is very little information available on this ternary semiconductor in photovoltaic applications though these films have shown good properties as a window layer for photovoltaic cells. The optical properties of Cd x Zn1- x S and PbS are appropriate for solar cell applications as window and absorber layers respectively. Therefore there is need to optimise these two materials for photovoltaic cell applications. In the event of optimising these thin films, this thesis also investigated the effect of doping CdS with zinc on the optical and electrical properties and finally fabricated a photovoltaic cell using the optimised thin film conditions. This thesis is organized into six chapters. The first chapter gives an introduction into the background of the research carried out and the rationale of the study. It describes the uses of thin films in the fabrication of optoelectronic devices and especially to convert solar energy to electrical energy by use of a p-n junction. A comparison of solar energy to other forms of fuel energies is made. It identifies the material of choice for the studies and gives reasons for the choice. It also states the specific research objectives and finally describes how the thesis is structured. The second chapter treats the relevant literature reported by other researchers by emphasises literature optical and electrical properties of doped CdS with various dopants. It briefly gives the results of band gaps variations, resistivity tenability obtained by different depositional methods and conditions. It greatly concentrates on CdZnS thin films deposited by Chemical Bath deposition method (CBD). It is concluded by an analysis of optical and electrical properties of lead sulphide thin films deposited by chemical solution at ambient temperatures. 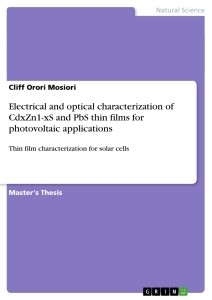 The chapter ends by describing some literature review that covers related work and some of the fabricated CdS/PbS photovoltaic cells and identifies the research gaps. Chapter three covers thin film theoretical considerations and the theory behind semiconductor thin film performance. It identifies the common properties to consider when optimising thin films for various applications by concentrating on the charge carrier transitions in both doped and pure semiconductor thin films. Optical phenomenon in thin films for photovoltaic applications is discussed by briefly describing a p-n junction, how it functions and its merits and demerits in photovoltaic applications. Methods and materials are presented in the fourth chapter while the fifth chapter deals with results in graphical format and in-depth discussion of most of the optical constants valuable for photovoltaic applications. Chapter six is the last chapter and it gives conclusions and recommendations. References are cited and appendices are presented thereafter. In this chapter a review of some related work on the deposition of cadmium sulphide and lead sulphide thin films has been done. CdS and PbS thin films are semiconductor compounds of the type II-VI that have developed great interests for many practical purposes especially for photovoltaic cells, photoconductive materials, optical detectors, photo- electrochemical cells, thin film transistors and other optoelectronic devices. Most of type II- VI thin films compounds includes compounds formed from elements of group II and VI of periodic table and a lot of studies have revealed much about their general nature, features of their chemical stability and their energy gaps at room temperature (Ohring, 1990). Group II-VI metal chalcogenide semiconductors particularly CdS, CdSe and CdTe have been of interest because they have high photoconductivity in the visible region. CdS has the best photoconductivity and is widely used in a large number of solid state device applications (Abu-safe et al., 2004). Today CdS is considered as the best suited window material for CdTe and CIGS solar cells. As the applications of CdS thin films increases their study also becomes popular among researchers because of their merits such as their smallness and lightness, their easiness of fabrication and the possibility of forming thin film circuits. Many researchers have focused their work on the enhancement of the optical (Amanullah et al., 2005) and electrical properties of pure (Al-yashi, 2007) and doped CdS films to produce high efficiency photovoltaic cells (Dzhafarov et al., 2006). This enhancement has been in progress for some time now and efforts to deposit large grain CdS films on low cost substrates are still on- going. The type of substrate used also plays an important role during the initial growth stages of CdS thin films (Ohring, 1990). In most cases CdS thin films grow as n -type semiconductors due to the donor centres formed during deposition. Vacancies of sulphur cause deviations from stoichiometry during its formation hence surface quality depends on the method used in preparation and it is important that the films be free of voids, grain frontiers etc. CdS is one of the semiconductors to investigate. A large variety of deposition techniques have been utilized to obtain photovoltaic cell quality layers like those that will be discussed in chapter three. It is important to note that there are some problems in each method. For example, it is difficult to obtain stoichiometric CdS by the evaporation technique while in spray deposition high temperatures are required (Ramaniah et al., 2000). Zinc has been used to dope CdS thin films (i.e. to obtain CdZnS). Cd 1-x Zn x S ternary semiconductors form a continuous series of solid solution allowing systematic variation of the band gap from 2.43 eV for CdS to about 3.7 eV for ZnS by adjusting the composition (Yokogawa et al., 1994). In CdS/CdTe solar cells, the replacement of CdS with a higher band gap ternary (Cd,Zn)S film can lead to a decrease in window absorption losses and an increase in the short-circuit current (Yamaguchi et al., 1999). The first well characterized deposition of a true (CdZn)S alloy film prepared by chemical bath deposition (CBD) was described in 1988 (Padam et al., 1988). In this work Cd and Zn acetates were used in various ratios complexed with ammonia, TEA and thiourea at 90-95 °C. Interestingly, Zn was more heavily complexed than Cd in its solution which showed that the mechanism of deposition was not only based solely on solubility product of the sulphides. Karanjai and Dasgupta, (1986) used the Chemical Bath Deposition (CBD) in the preparation of sulphide thin films on soda-glass substrates including Cd, Zn and Cd-Zn mixed sulphide films and reported uniform films. Adhesion of CdS films to the substrate was found to be dependent on the [Cd]:[S] ratio in the starting solution. The small crystals of pure ZnS and the larger ones of pure CdS suggested a cluster mechanism and an ion-by-ion mechanism respectively. Electrical properties of CdS thin films depend on the deposition condition. Evaporated films prepared for solar cell applications usually have resistivity in the range of 1 to 1000 Ω-cm (Mahmoud et al., 2000). They are usually n -type in conductivity dominated by the deviation from stoichiometry which influences the films to have S vacancies or Cd excess. Resistivity decreases as the thin film thickness increase. In thermal evaporation the [Cd]:[S] ratio during evaporation influences the electrical properties as does when doping. For CdS films doped with indium (CdS:In), the best electrical properties are obtained at a [Cd]:[S] ratio of 1:5 at which the films also exhibit resistivity values as low as 10-3 Ω cm on CdS:In [1.5%)] samples (Shadia et al., 2010). Resistivity of doped evaporated films is relatively insensitive to substrate temperature during deposition which contrasts the strong dependence of the resistivity of un-doped films on deposition temperature. CdS thin films evaporated for photovoltaic cell applications have carrier concentrations in the range 1016 to 1018 cm-3 and minority carrier diffusion lengths in the range 0.1 to 0.3 μm and films grown at higher rates exhibit higher carrier concentration that increase with increase in film thickness. Those doped with indium increases their carrier concentration by almost three orders of magnitude up to a concentration of about 2% by weight and thereafter the carrier concentration does not increase (Shadia et al., 2010). It is noted that at low indium concentrations, the carrier concentration and mobility decreases. Chlorine has been used to dop CdS thin films. It has been reported that the CdS films doped with chlorine gas present very low photoconductivity at room temperature and their Hall mobility decreases with heat treatment (Tsai et al., 1996). Those prepared by evaporating CdCl2 mixed CdS powders increases in resistivity and carrier concentration. A rapid incremental behaviour of mobility for the pure and low-doped films below 0.05% CdCl2 concentration was also noted (Abu-safe et al., 2004). The electrical properties in spray deposited CdS films are dominated by the chemisorption of O2 at the grain boundaries which reduces both the carrier concentration and mobility. The films are invariably n -type with resistivity varying over a range as much as 108 Ω-cm. Post deposition annealing in air increases the resistivity of CdS films to about 107 Ω-cm and makes them highly photo- conducting. A photoconductive gain from 106 to 107 with response time of about 1 m s under 50 mW cm-2 illumination has been reported (Song et al., 2005). In vacuum annealing, the resistivity decreases to 1 - 10 Ω-cm and the photoconductivity is quenched indicating the reversibility of chemisorption and desorption of oxygen. Electrical properties of CdS thin films grown by Closed-Space Vapour Transport [CSVT] show strong dependence on growth conditions especially substrate temperature. The films showed that the carrier concentration increased exponentially with increase in substrate temperature and exhibited very high mobilities while their resistivity varied from 10-3 to 1 Ω- cm as a function of the substrate temperature (Tsai et al., 1996). Un-doped epitaxial CdS films grown by CVD exhibit resistivity between 10 and 100 Ω-cm. Annealing them in H2/Ar at 400 °C reduces resistivity values to between 0.01 and 0.05 Ω-cm and when doped with indium the films possess carrier concentrations of 1018 cm-3 and Hall mobility of 65 cm2 V-1 s- 1 (Bacaksi and Cerik, 2006). The as-deposited sputtered CdS films exhibit a high resistivity up to 10s Q-cm while co-sputtering them with indium yields films with resistivity of about 1 fi-cm and changes their conductivity to p-type with hole mobility of 6 - 15 cm2 V1 s'1 and a carrier concentration of about 7x 1018 cm'3 (Shadia et al., 2010). In most cases chemically bath deposited CdS films are n -type and have resistivity in the range 107 to 109 Ω-cm and on annealing them in a vacuum their resistivity decreases to about 1 to 10 Ω-cm. This reduction is attributed to desorption of O2 from the films. When annealed in air they exhibit high photosensitivity, have a carrier concentration of about 1014 cm-3 and a mobility of 5cm2 V-1 s-1 measured under normal illumination. As-deposited CdS films show a higher resistivity than those annealed due to the creation of number of sulphur vacancies in the films (Ramaiah et al., 2000). Similar observations for CBD prepared films but after annealing at 200 °C in a vacuum and in argon that showed resistivity decreasing from 105 Ω- cm to about 10 Ωcm were also reported (Herrero et al., 2000). Uda and co-workers reported similar results of resistivity but for films thinner than 0.5 μm (Uda et al., 1990). Many researchers have reported in literature that resistivity of CdS films decrease with increasing thickness (Sheeja et al., 2009). These reports also add that an increase in carrier concentration with reduced carrier mobility is observed for any increase of cadmium ion concentration (Akkad and Naby, 1989). Observed results show that growing films with increasing cadmium ion concentration in the bath incorporate more cadmium (Cd) in the deposited films. This makes the response of the films when under illumination reduce their resistivity between 3 - 5 orders of magnitude (Guillen et al., 2001). Mahmoud and co-wokers (2000) observed that co-deposition of CdS-ZnS films by CBD at 800 C causes sheet resistance to increase linearly (Mohmoud et al., 2000). In a similar case Kumar and Sankaranarayanan, (2009) reported the resistivity of (CdZn)S thin films on soda-lime glass substrates grown by CBD for CGS solar cells and their resistivity varied linearly on a log ρ scale from 109 Ω-cm (CdS) to 1014 Ω-cm (ZnS). Using ammonia-complexed metal iodide and thiourea at pH 10 produced films whose properties depended on the temperature of deposition. Their resistivity decreased with an increase in Zn content from 1010 Ω-cm for CdS to 106 Ω-cm for a 90% solution concentration of Zn and then increased to 109 Ω-cm for a pure ZnS. The films were photoconductive with resistivity decreasing as a function of composition up to about 5 x 103 for the 90% Zn films (Yamaguchi et al., 1999). No explanation for this effect was given and therefore suggesting that more research can be done on this material. Optical properties of CdS films are determined to a large extent by the microstructure of the films themselves and also by the deposition conditions. Cadmium sulphide thin films have high visible transmittance and a good near-IR reflectance. It has been found that the optical absorption edge of CdS films prepared by vacuum evaporation (VE), screen printing (SP) and CBD shifts to higher wavelengths as the film thickness increase. Thin evaporated CdS films are smooth and specularly reflecting (Amanullah et al., 2005). Their surface roughness increases with an increase in thickness leading to a large diffuse scattering component in thick films. The optical constants n and k have been determined for evaporated thin films over the wavelength range of 0.25 μm to 2.0 μm by measuring normal incidence reflectance and transmittance and taking into account surface roughness. Analysis yielded direct transitions in the range of 2.42 eV to 2.82 eV and it combined both direct and indirect transitions beyond 2.82 eV. The n and k values were observed to be dependent on the substrate temperature during deposition. At higher substrate temperatures the refractive index approached that of single crystal material. It has also been reported that refractive index increases with increase in film thickness while the extinction coefficient decreases rapidly with an increase in wavelength in the range 400 - 600 nm (Mahmoud et al., 2000) because thickness increases optical density. Sputtered CdS films have a sharp optical transmission cut-off near 0.52 μm corresponding to the band gap of CdS but in spray deposited films the band gap and the fundamental optical absorption edge are not affected by the microstructure (Vigil-Galan et al., 2005). Diffuse scattering and transmittance depend on film thickness, substrate temperature, [Cd]:[S] ratio and increase in film thickness but reduced by increasing deposition temperature (Yokogawa et al., 1994). Different band gap values of CdS thin film have been reported from 2.30 eV - 2.60 eV depending on the deposition conditions, thickness and annealing temperature. Many researchers (Abu-safe et al., 2004, Oumous et al., 1999, Vigil-Galan et al., 2005, Dzhafarov et al., 2006 Yamaguchi et al., 1999) report that as the thickness of the film increase the absorption edge shifts towards lower energy region (higher wavelengths) and becomes much sharper (i.e. the band gap decrease). It has also been reported that films present a steep absorption edge at a wavelength of 500 nm (Oumous and Hadiri,2001) with a band gap value of about 2.45 eV and their refractive index was of about 2 eV for the higher wavelengths while after annealing the absorption edge undergoes a slight shift towards the higher wavelengths. It has been reported that CBD grown CdS films prepared from different sources of cadmium (chloride or acetate) present high transmissions 70 - 80% (Rami et al., 1990) and therefore it has been deduced that very thin CdS films allow a high transmission even at wavelengths below 500 nm that corresponds to CdS energy gap until the stronger absorption detected at 300 nm due to the glass substrate. Average transmittance in the 400 - 800 nm wavelength range mainly depends on the cadmium sulphide thickness as a consequence of the higher absorption occurring in the films (Herrero et al., 2000). Experimental data demonstrate that in CdS-SnO2 bi-layer transmission is more dependent on the type of SnO2 substrate than on thiourea concentration used during the CdS deposition process and thus absorption coefficient [α] in the order of 1 to10 cm for energies greater than 2.4 eV has been achieved (Herrero et al., 2000). A direct forbidden energy gap of about 2.48 eV, refractive index that follows Mayer’s law equal to 2.116 for the high wavelengths has also been attained. A band gap range of 2.45 - 2.50 eV at the absorption edge has also been reported (Popescu et al., 2010). When zinc is used as an impurity, the CdZnS thin films deposited by diffusing Zn into CdS have band gap energy of 2.64 eV (Cd0.74Zn0.26S) which exceeds the band gap of CdS of 2.43 eV. It was concluded that inter-diffusion in Zn/CdS structures at temperatures exceeding melting point of Zn is accompanied by the formation of Cd1- x Zn x S ternary compounds (Kasim et al., 2008). These films had an optical transmittance of 80% and a direct band of 2.49 eV. Guoshi and co-workers (2009) observed that Zn2 + ions in chemical bath doping regulate the growth rate and the formation of ternary CdZnS films in (Guoshi et al., 2009) while Kumar and Sankaranarayanan, (2009) noted that Zn2 + cause the band gap of CdS to be tunable depending on its concentration in the bath. When spray pyrolysis is used it is observed that CdZnS films have optical transmittance above 65% in the wavelength range 450 - 800 nm and direct band gap of between 2.47 - 3.04 eV (Saliha et al., 2006). Song et al. (2005) made a study on (CdZn)S thin films grown on soda-lime glass substrates by CBD process for applications in copper gallium selenide [CGS] solar cells. Optical absorbance (A) and transmittance (T) spectra measured over the wavelength range of 300 to 1100 nm showed that 30 % of Zn in the solution had better than 80 % transmittance for wavelengths longer than 600 nm and thickness less than 50nm. Energy band gaps obtained were 2.40, 2.55 and 2.70 eV for Zn- content of 0, 30 and 50 %, respectively. The band gap calculated from optical absorption spectroscopy varied almost linearly with composition between that of CdS (2.4 eV) and ZnS (3.6 eV). An analysis of the absorption spectrum by Dzhafarov et al. (2006) indicated the formation of CdZnS compound with the largest value of energy band gap up to 2.64 eV. The spectrum of CdS film showed allowed direct band gap with single slope while the spectrum of the Zn/CdS could not be characterized by one slope but rather presented a curve with changing slopes (Dzhafarov et al., 2006) and from Yamaguchi et al. (1999). Considering the findings reported here it is made clear that zinc doped CdS offers good photovoltaic properties that need to be optimised and consequently be used to fabricate an efficient photovoltaic cell. A choice of an easy and cheap deposition technique was of essence. In this thesis cadmium nitrate, zinc nitrate and thiourea were used and moderate temperature baking done to form cadmium- zinc- sulphide thin films and all the other products remained in solution. Lead sulphide is an important direct narrow gap semiconductor material with an approximate energy band gap of 0.4 eV at 300K and a relatively large excitation Bohr radius of 18 nm. These two properties make PbS films very suitable for infrared detection and solar cell applications. It is a material that has also been used in many fields such as photography, Pb2 + ion selective sensors, solar absorption etc. These properties have been correlated with the growth conditions and the nature of substrates used. CBD prepared PbS thin films are reported to have a cubic centred structure with a preferential orientation of200 perpendicular in direction to the plane of the substrate as well as being amorphous (Seghaier et al., 2006) with lower spectral reflectance and transmittance [below 40%] in the wavelength range of 300 - 1800 nm. This is due to diffuse reflections from the surface of the thin films while their dark electrical resistance is in the range of 1010 - 1011 Ω/cm for ‘nano-crystalline’ and 105 - 106 Ω/cm for ‘standard’ films. Both cases the films were of p -type conductivity (Pentia et al., 2001). Popescu and co-workers (2010) reported on the photosensitivity of PbS films after a long thermal treatment at 900 C in air as being 23.75 % to 50 % (Popescu et al., 2010). A non-linear relationship between CBD deposition time and absorbance on as-deposited PbS films for varied deposition times has been observed (Amusan et al., 2007). Infrared transmissions and photoluminescence spectroscopy show a tunable band gap for bulk and nanostructures as from 0.41eV - 0.48eV when deposited on GeAs coated substrates (Osherov et al., 2010). The blue shifts in both absorbance and emission peaks of the nano-structured layers are obtained due to quantum size effects and the band gap edge. Valenzuela et al. (2003) reported on CBD deposited PbS films in the wavelength range of 240 - 840 nm at temperature ranges of 10 - 300 C and established values of dielectric constant (ε) that were attributed to the empty spaces between the aggregates. The AFM analysis showed a mixture of PbS and voids but the structure was similar to the one reported by Seghaeir et al. (2006). 0.93 eV - 1.0 eV from photocurrent measurement. Ghamsari and Khosravi, (2005) reported high absorbance levels at lower wavelength range of 350 - 500 nm (above 60% absorbance). Direct allowed transitions in the energy range 1.88 - 2.28 eV and a decrease in dc resistivity with grain size has been observed (Ubale et al., 2007). The films were p -type with crystals similar to those deposited using sol gel and spin coating methods but with direct band gap of 0.41 eV and a dc electrical conductivity of 105 - 106 Ωcm-1 (Mulik et al., 2010). PbS thin films with optical absorption in the range of 70 - 75% for wavelength range [350 - 850 nm] have good absorbance in the visible region (Patil et al., 2006). Many research groups have shown a great interest in the development and study of PbS by various deposition processes. CBD is attracting considerable attention as it does not require sophisticated instrumentation and it is relatively inexpensive, easy to handle, convenient for large area deposition and capable of yielding good quality thin films (Misle, 2009). Since the AFM analysis done by Seghaeir et al. (2006) showed a mixture of both PbS quantum dots and voids in their structure while that by Popa et al. (2006) reported an absorption band in the infrared range [1250 - 2400 nm] of 1.23 eV - 1.28 eV from absorption measurements and a band gap of between 0.93 eV - 1.0 eV from photocurrent measurement. It suggested that PbS thin films can be optimised and provide a good absorber material for both infrared and visible light spectrum. This thesis also reports the electrical and optical properties of PbS thin films obtained by CBD technique at various concentrations of the precursor solutions. CdS and PbS semiconductor materials are the most widely investigated by chemical deposition technique and especially CBD. Starting in 1969 into 1970’s, photovoltaic cells of CdS/PbS have been reported with Voc of up to 450 mV and Jsc less than 1 mA/cm2. However, further reports on this type of cells are scarce. Harumi et al. (1995) revisited the CdS/PbS cells and the photovoltaic junction fabricated presented a photovoltaic behaviour of distinctive cell structures prepared by chemical deposition; [glass/CdS/PbS/Ag, SnO2:F/CdS/PbS/Ag, and SnO2:F/CdS/(Bi2S3 or/and CdSe)/PbS/Ag]. Depending on the cell type, Voc of greater than 500 mV or Jsc greater than 3 mA/cm2 were reported under illumination of 1-3 kW/m2 (Harumi et al., 1995). Any new technology for producing photovoltaic cells is now based on the use of materials with very thin film geometry. This ensures that there is a low cost for solar energy conversion, less material consumption and easiness to obtain very small integrated modules. This study is investigating the performance of a CdZnS/PbS photovoltaic cell with an intention of opening up the possibilities of developing simple photovoltaic cell structures by sequential chemical deposition of doped CdZnS and PbS layers for harvesting both the visible and infrared light spectrum. Semiconductors materials exhibit a number of useful but also unique properties related to their electronic structure. Semiconductors can be fabricated to be in bulk, wafer or in thin film forms. A semiconductor material is said to be in thin film form only when it is built up as a thin layer on a solid support called substrate by a controlled condensation of the individual atomic, molecular, or ionic species (Amanullah et al., 2005). Thin films are also regarded as two dimensional materials fabricated by the process of condensation of atoms, molecules or ions. This is what makes them have unique properties significantly different from their corresponding bulk materials. These unique properties are as a result of the changes that occur in their physical dimensions, geometry and microstructure. Thick films are prepared either by a direct application of solution dispersion or by a paste of the material on a substrate and then letting them dry irrespective of their thickness (Khallaf et al., 2009). In thin films there are deviations from the properties of the corresponding bulk materials that arise because of their small thickness, large surface-to-volume ratio and their unique physical structure which is a direct consequence of the growth process (Amanullah et al., 2005). Most of the new thin film technologies coming up are based on the use of materials with very thin film geometry because they tend to lower costs and also lower material consumption (Shadia et al., 2008). It is currently known that a relatively small group of elements and compounds have an important electrical property called ‘semi-conduction’. This is a property where they are neither good electrical conductors nor good electrical insulators but instead their ability to conduct electricity is intermediate and that is why these materials are called semiconductors. 1 (Bacaksi and Cerik, 2006). The as-deposited sputtered CdS films exhibit a high resistivity up to 108 Ω-cm while co-sputtering them with indium yields films with resistivity of about 1 Ω-cm and changes their conductivity to p -type with hole mobility of 6 - 15 cm2 V-1 s-1 and a carrier concentration of about 7×1018 cm-3 (Shadia et al., 2010). Characterization of Morality and Values in Arthur Miller's Play "The Crucible"